Nintendo conducted a poll for Fire Emblem Heroes urging fans to pick a favorite character of theirs that they would love to see featured. 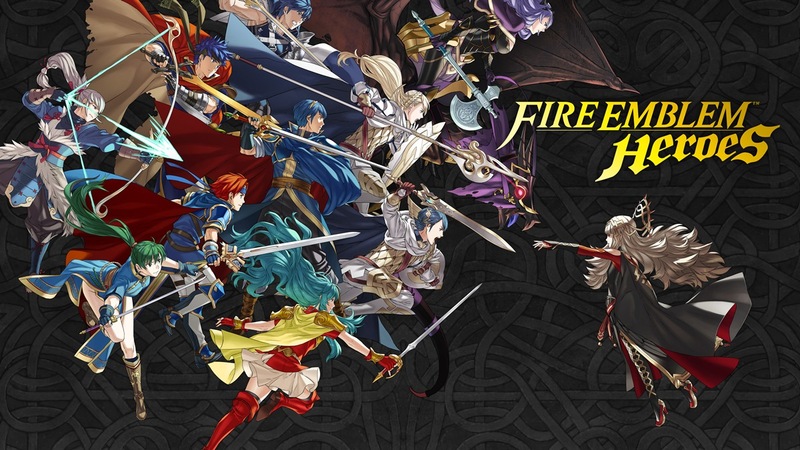 Each fan could vote once a day for 13 days for almost any character from any of the Fire Emblem series of games. The competition had since ended, and results posted. Nintendo reported an overall outcome of 1.2 million votes. As you can imagine the selection was quite vast! I thought it may be fun to take a look at the results and analyze/comment on them! You can see the full list of results here (1-100, but there are options for beyond). For our purposes, we will look at the top 20. This was a worldwide contest from all territories. All votes were included to one ballot. This is useful to know when it comes to character popularity. Some characters were split if they appeared in multiple games. This is a point worth considering as we will see, as their votes were counted separately. Each individual was able to vote multiple times. One person could vote 13 times over the event period (and this assumes from one device)! As such, do not treat “1.2 million votes” as “1.2 million people” There is an important distinction. Nintendo had released midterm results on current poll standings. I consider this an important aspect in determining the final outcome, as I will address. No characters from FE2, 4, 5 (Gaiden, Genealogy of the Holy War, Thracia 776) made it to the top 20. Game with most characters on this top 20 is FE13 (Awakening) with Followed by FE14 (Fates) and FE7 (the Blazing Blade) tied with three, and FE8 (the Sacred Stones) with two. 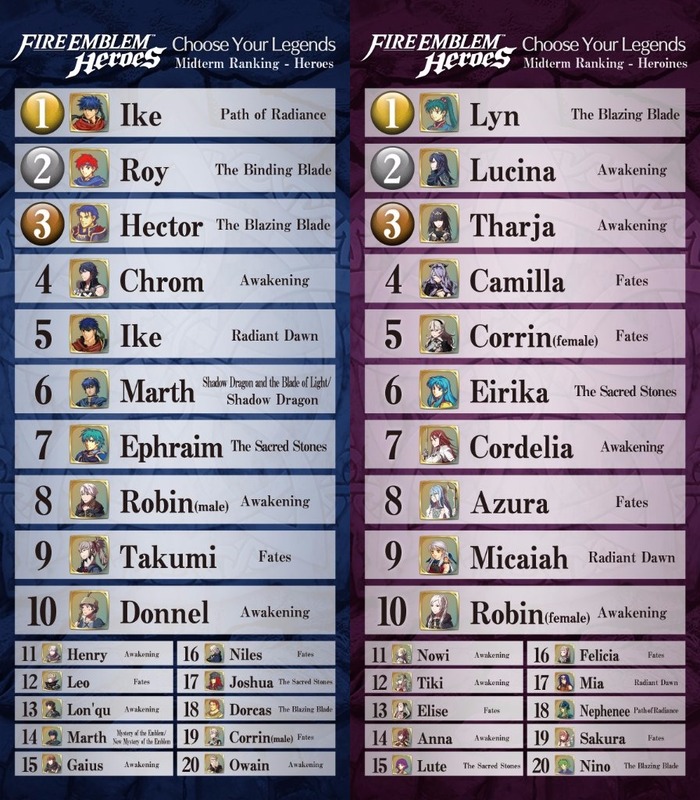 Of the characters on this list: Henry, Dorcas, Donnel, Lon’qu, Gaius, Niles, and Joshua are not “lords” or “main characters.” The highest non-main male character is thus Henry (Awakening), closely followed by Dorcas (the Blazing Blade). Dorcas and Joshua are the only non-main characters from the “pre-Kozaki” era of games. All non-DLC male Fire Emblem characters that appear in the Smash Bros. series appear on this list, and on the top 10. (Corrin (male), who is DLC for Smash Bros. for 3DS and Wii U is missing). Marth would have 24,547 (boosting him to 4th place, beating Chrom at 23,803). If Robin (male) had his female counterpart’s votes, he would beat Chrom and be below Hector, with a total of 24,536. He would be right below a combined Marth by just 9 votes! Though not included on this list, to put things in perspective, if we were combining more votes on characters who do not change significantly between two games: Soren and the Black Knight would have both placed on the top 20. Black Knight would be at 14th place beating Lon’qu with 10,195 votes, and Soren in 15th beating Gaius with 9718 votes. Their votes were split fairly evenly between both Tellius games, and, as a result, place far from the top 20. If Corrin (male, not shown on this top 20 as he ended up in 41st place) gained his female counterpart’s votes, he would have been boosted to 3rd place, beating even Hector with a total of 27,290 votes. There’s a lot of fun data in here. Ike won by quite a margin, a full 5000+ vote lead on Roy. This was only accounting for the (slimmer) Path of Radiance Ike as well. The combined numbers presented above give an idea of how the character alone would fare. I suppose on could argue that it was voting for which depiction of Ike fans preferred, both in character and physique. However, for Marth who had not changed much between the games, the split vote hurt him much more. He ended up in 6th place, whereas with combined votes he would’ve ended up above Chrom in 4th place. That’s a pretty big jump! A reason for this was perhaps the fact FE12 (a remake of 3) had not come out in the west, where as FE11 (a remake of FE1) had come as Shadow Dragon. Of course it may have been to keep things simple too. You can see in terms of most characters, including non-leads, Awakening won this category by far. It makes sense as the game that “saved the series” and brought an influx of new fans (and won many old ones) with its varied cast of characters that stuck out. Fates follows and ties with Blazing Blade in terms of the runner up of characters, with three each. It seemed in that sense, Awakening had set a better standard when it came to characters presented! The biggest surprises for me, personally, are Hector in third place and Ephraim in seventh. Hector is one of the three main lords from Blazing Blade, and has had no significant Smash Bros representation. Ephraim is similar appearing in Sacred Stones as one of the two main characters. It is surprising they managed to beat out fan favorites from Fates (Takumi and Leo) despite being in games that came out much longer ago. Perhaps there was an old sense of love for them, considering Hector is often cited as favorite FE rep for Smash Bros due to wielding an axe rather than a sword –Ephraim for the same reason as he wields a lance. Both the above games are available on the Virtual Console as well, getting around the issue many who want to play Ike’s games (the Tellius games) have with high priced GC/Wii prices on the secondhand market. Ike had won a popularity contest in Famitsu as well, with his Smash Bros. representation likely carrying him this far. Indeed, he has appeared in Fates as an amiibo bonus as well. Love for him has continued to be strong despite the lower sales on the two console games! Corrin (male) did not make this list despite appearing in the latest Smash Bros. game. There can be several reasons. For one, being a DLC character that one must pay for may have already turned off those who were unfamiliar with him and held little interest. Essentially, it would be Fire Emblem fans or people who were willing to pay for more characters in Smash Bros. that would be willing to pay for him, rather than a general player. Roy is DLC in the latest game too, but appeared included in the beloved second game of the series ( Melee ) so was likely not effected as much. The other possibility is his unpopularity among Fire Emblem fans in general who experienced Fates and were less than pleased with his character. That is not to say he does not have fans, though. If you see the midterm results (farther down the page), you will see he originally had made it to the top 20 before being replaced. However, a potential counter-argument is that perhaps more simply voted for his female counterpart (which is true, see more in the next section). Consider Robin, who has a female counterpart. He made it to this list and was a non-DLC newcomer to Smash Bros for 3DS and Wii U. He has been around in Fire Emblem slightly longer (Awakening), and was slightly less controversial as a character. Dorcas placing this high I assume was due to memeification after the midterm results (and perhaps even from before) and definitely sticks out as the oddball of this entire list, considering he is the second favorite non-main male it seems! No characters from FE2, 4, 5, 6 (Gaiden, Genealogy of the Holy War, Thracia 776, Binding Blade) made it to the top 20. Game with most characters on this top 20 is FE13 (Awakening) with seven, followed by FE14 (Fates) with six. Of the characters on this list, ten are “non-main” characters. The highest non-main female character is thus Tharja (Awakening). All female Fire Emblem characters that appear in the Smash Bros. series appear on this list, and on the top 11. This includes Corrin (Female) who scored much more than her male counterpart, despite being DLC in Smash Bros.
Mia would have 13,354 (boosting her up to 9th place to beat Nowi). (Her Path of Radiance version had 4,408 votes, seen on extended list). Nephenee would have 13,473 (boosting her to 9th place just before Micaiah, beating Nowi.) (Her Radiant Dawn appearance had 5,557 votes). That means if above were considered together, it would be Nephenee in 9th and Mia in 10th, Nowi and the rest pushed down to 11 and beyond. Even if Robin (female) got all of her male counterpart’s votes (24,536 total), she would still be below Camilla and remain in the same place. If Corrin (female) got some extra votes from her male counterpart, she would beat Camilla but fall short of Tharja with a total of 27,290 votes. The female character chart reveals something very different. Lyn won with a 7000 vote lead, likely thanks to her already standing popularity as seen in the Famitsu poll, status as first (widely) known female lord, and status in Smash Bros. as an assist trophy that may have raised interest. Right after is fan favorites Lucina, Tharja, and Camilla, who were pretty much expected to place near the top (especially with Japanese fans considered). Nowi made it pretty high, likely thanks to her support on the Japanese side of things, as her western popularity is often controversial. Two big things: There are more Kozaki-era characters (FE13/14) on here (13) than on the other chart. With that, the winning members here had scores much higher individually than their male counterparts. This goes back to what I said before about only being able to cast one vote toward one gender character or the other, which means many more may have cast a vote for a female character than not. A possible reason for this may be the marriage system that exists in both Awakening and Fates that would have allowed player attachments to these characters to form, and thus be more memorable when it came to voting. Lyn and Lucina’s roles (and Lucina’s as both role and potential daughter or wife depending on decision) may have contributed to their top scores above the rest. That leaves Eirika as an interesting pick for 6th place, as her game is often overshadowed by the ones that surround it. Corrin (Female) appears in the top 5 here, a huge contrast to her male counterpart! It can be a case of most preferring the female Corrin based on appearance or more fitting to the “role” of the Princess caught in between two families. It shows that perhaps it is not the “character” at fault, and merely that people preferred to vote for the female incarnation. Remember they could only vote one way. More on this in the next section. You can see female Robin appears here too, losing to the female Corrin. That is a note to consider for the next section. No characters from FE2, 4, 5, (Gaiden, Genealogy of the Holy War, Thracia 776) made it to the top 20. There are nine female characters on the top 20, versus eleven males. However! Two of the men (Marth and Ike) are featured twice, meaning that it may be considered an even nine and nine. Despite more male characters on the list (if both Marth and Ike are counted separately), the female characters still had more overall votes at 226,171 versus 212,799. Game with the most characters on this top 20 is FE13 (Awakening) with six, followed by FE14 (Fates) with five. Of the characters on this list, only three are “non-main” characters, with Tharja placing highest. All Fire Emblem characters that appear in the Smash Bros. series appear on this list. (Though just male Robin and Corrin). Eight out of ten characters that placed high in the Famitsu popularity poll also made it to the top 20 characters here. Ike would have 51,555 (boosting him to 1st place overall). Marth would have 24,547 (boosting him to 8th place, beating Chrom at 23,803). Corrin (Female + Male) would have 27,290 votes, placing 6th above Hector. Robin (Male + Female) would have 24,536 votes, placing 8th above Chrom, right below a (combined) Marth. When we look at them combined, we see some common trends on both lists. For one, Lyn had the most individual uncombined votes, beating the male counterpart (Ike) by far. Placing top may be due to her continued presence in Smash Bros. as an assist trophy, as well as the fact she was one of the earlier DLC characters for Awakening as well. This would aid new fans in recognizing her, as well as fans of Smash Bros. but not particularly Fire Emblem who would have taken interest in her. Awakening has the most characters on this list, followed by Fates. It makes sense for the two recent installments that were also among the most popular games that brought in new fans to have many of the voted favorites. Awakening placed top for “favorite game” on the Famitsu poll as well. The beloved Jugdral games (FE4 and 5) did not appear on any of the polls (and many of their characters actually placed in last). This may be due to the lack of official worldwide representation for them, as well as lack of Smash Bros. representation as well. The games are old enough that many Japanese fans who had played them may no longer be interested in the series, or actively participating in it. There are many reasons why the game likely did not place at all. Roy of Binding Blade came in an impressive top spot, likely owing it to his Smash Bros. Melee debut that helped bring the games to the west in the first place. The rest of the Binding Blade cast were lower than the games that were released westward. In addition to Roy, the other characters seen in the Smash Bros. games all appeared, likely again due to already being familiar to many who would have voted. Ike wins out if his votes are combined, however, soaring above Lyn’s count. But it can be argued that Ike’s character (in both appearance and personality) is different enough between the two versions (FE9 and 10) to keep them separate. This is quite interesting considering the Tellius games are notably harder to find and did not sell too much compared to the other Fire Emblem games. Marth however is more of the same, but is still split between two here –and even when combined only increases his standing enough to beat only Chrom. Hector earns a special place at 6th, impressive because he lacks any notable Smash Bros. representation or any real representation outside of Blazing Blade. He’s also my site mascot’s father, so this is nice to see on a personal level, too! Micaiah (placed 17th) is also a pleasant surprise, as Radiant Dawn had sold relatively little compared to the other games as mentioned with Ike, and she is quite a controversial character even among the fanbase. Robin (Male) beat Robin (Female). Perhaps what I said on Corrin (Female) being the preferred applied in reverse to Robin’s situation. (Perhaps more perceive Robin as Lucina’s husband-to-be rather than mother? Or perhaps preferred him paired with another female character entirely?) There can be many reasons, but vote-wise the male one certainly won out. It may be worth noting his default amiibo is male too! Regarding female Corrin, If these people voted for male Corrin instead, the character would have ended up right below Chrom. If combined with the female Corrin’s votes, he would have been even higher, above Hector. Their vote differential was the largest between counterparts on the top spaces, with female scoring 19,599 and male only 7,691 (11,908). It is a much bigger difference than male and female Robin, who had 14,149 and 10,387 votes respectively (making a difference of 3762 votes). I was more reluctant to combine the different genders as their appearances of course would be notably different. The appearance (and arguably gender) goes a long way on these votes as the data show. However, their characters are more or less the same (with minor changes to apply to genders when it comes to marriage). Ike on the other hand between FE9/10 is a similar character, but also looks significantly different between titles. This once again comes back to Marth who is the only one who would not have changed significantly between his games. Perhaps it was to avoid all these exceptions that they decided to split the votes among different incarnations of the same character. Considering the top places would get special appearances, their looks were indeed more important than simply popularity as a character, and rather as a character as they appear in a certain game/form. Characters hurt most by a split vote were those featured in multiple games not set too far apart from each other. (The Tellius games, for example, as a vast majority of the characters are the same, considering the game was not too long after). Nephenee, for instance, may have placed higher if her votes were combined despite her character and appearance being nearly identical. The overall vote differences I mentioned in the notes (226,171 female character votes versus 212,799 male character ones) also make for an interesting question. If you combine the above two, that makes 438,970 votes. Now if voters were not limited to one character overall, and instead one character per gender, how would the results have changed, if at all? That is a significantly larger amount, and it would have been interesting to see how those who voted for a female character would have voted for a male character (and vice versa). For instance, I myself did not vote any male characters, even though there were plenty I wanted to see and would’ve voted for had I not been limited to one per either gender character per day! So the midterm standing list (seen above) looks more or less like the final list. Overall, you can see that the order largely remained the same. The only one who lost their overall footing was Corrin (Male), with Eliwood appearing. The match was closer with the 11-20 female characters who shifted around in place slightly, but there was no upset to the top picks, who seem to have already solidified their position by midterm. The potential issue with revealing midterm results may have contributed, however. People who voted their favorites from more niche titles may have abandoned them for the next several days to vote for their favorites on this list. That would mean the competition becomes fierce among the contenders who already made it this far, skewing the overall popularity in favor for those who were overall by midterm. This is not completely true nor able to be discerned with full certainty from this list alone, however. Eliwood, for instance, took Corrin (Male) off his place and came up despite not appearing here at all, meaning he may have had some faithful still voting for him regardless of his lack of appearance on this chart. It can also be a case of these characters being so far ahead in midterm already that it would not matter as the rest of the votes were scattered among so many characters. Still, it is important to note how some may abandon voting on who they want versus who they want from this chart. For that reason I still bring it up as a potential game changer. Ike and Lyn’s popularity remains high, as do the other characters that are featured in the Smash Bros. series. Outside of that, Awakening and Fates’ characters flex their popularity by appearing in the largest numbers on these lists. With high sales, recent relevance, and plenty of fans (both old and new) behind them, the lists become more or less what people would expect from an overall popularity poll. Overall, it seems the most important factor was exposure, as evident by the amount of main characters that appear, notably the Smash Bros characters. Many of the non-Smash Bros characters were from the more recent games as well as those that faced worldwide release. Which makes sense for what essentially becomes a popularity contest, right? There were some limitations to the polling (as noted throughout the article when relevant), but should give a good idea at where characters stand overall with these in mind. But hey, her father made it! I am quite content. Please share any thoughts you may have too below, or anything else you may deem worthy of analysis! This entry was posted in Fire Emblem, Video Games, Website and tagged analysis, android, fe heroes, fire emblem heroes, intelligent systems, ios, kantopia, mobile, nintendo, poll results, popularity poll. Bookmark the permalink. Yes, a lot of the FE9/10 characters suffered thanks to that! I’m happy Takumi was so high up on the list! He’s definitely one of my favorite characters thanks to his subplot. He got to be one of the deeper and more complex characters, which likely made him memorable to both his fans and non-fans, and hence the higher numbers here too! For sure. Who’re some of your favorites? In Fates or in general? In Fates I liked Shura. I felt he had more potential to expand upon regarding his back story, so wish we got more on that. Of the royal siblings, I felt Leo on Nohr and Sakura on Hoshido had some things going for them. Leo by mirroring Takumi’s conflict (though to a lesser extent) toward Corrin. Sakura I place here because her innocence seems to not really have ill-will toward Nohr in particular (Elise is the same I suppose), but they did not really expand upon what they could have in this sense too. Ryouma is already duty bound so his loyalties make sense! A few honorable mentions goes to Nyx and Oboro, who both have their own background complexities going on. Oh sorry should’ve clarified! Shura was really cool but I agree that he should’ve been given more development. And I like Sakura too. I never understood the hate for her. Her death was soooo brutal. Sakura or Elise? Since Sakura survives as far as I recall, right? And sorry I meant Elise!! Haha poor Xander…. And yeah…a lot of the character’s surprisingly didn’t get enough development or just had a terrible life haha. Yes… so I feel the reason people pin Fates to have a weak story is that they focused on some things perhaps unnecessary, but then ignored some other important questions and key points of development. We’ll see how they do next game! I can agree to a sense, but I still think they did a good job. I hope their next game is better too! I think Awakening’s cast is overall the best in the series. A lot of people get on their case for being quirky, but it’s not like anything new for the series, and for once they actually try to give every single character a REASON for being like that, if not deconstructing the quirk altogether. The voice acting combined with this made them really fleshed out and just lovable in a way that’s made me get attached to the game when I can’t really feel the way about any of the others I’ve tried to. I just really wanted RD Ike to show some emotion for once. Have him struggle with the weight of being a general. Have the stress slowly break him until he runs away at the end. For the love of God, show us that he’s still HUMAN. Give him something to struggle against instead of a lazy rehash of the vs the Black Knight subplot you already did that he doesn’t seem to care about anyway. You know what’s something that would have really improved RD’s story? If they had made it canon that Ike failed against the Black Knight. That way, no dumbass excuses about “I let you win” (which makes even LESS sense than “my warp powder malfunctioned” considering you can see the scars in his armor wear he was CUT THROUGH THE FACE AND CHEST. You don’t just get up and walk away from that. You just don’t.) AND Ike gets to struggle with insecurities about being weak and unresolved regrets about his father’s death, giving him an obvious way to grow as a character. Ugggh, I didn’t mean to rant, but… so many good characters with a lot going for them, and what does he have? Muscles. He really doesn’t deserve to be up there. Thank you for the insightful post! I don’t mind the rant, as it is not disrespectful in any way and expresses your thoughts on the matter, so no need to apologize! I understand your point about Awakening’s characters. I am sure many felt the same way, and probably felt that impact as well as other interactions (marriage, etc) made them quite memorable in the eyes of many. I suppose the things you listed may be why PoR Ike won out over RD Ike. I assume they felt his struggles were done in FE9 and now he was just trying to surpass his father, where the real struggle was meant for Micaiah and such… him running away in the end is still a hot point among fans though, for sure. At least your version gives some backing as to why he may have done so! The funny thing is I’ll be exploring the Black Knight’s dialogue in my next comparison post. It is an interesting difference between the two versions… well anyway that may provide some interesting insight! Cool, I’ll be sure to check it out. I saw someone on tumblr who had apparently counted up all votes for split characters for males, which wound up with a merged Ike opening up a space, and BK and Soren to come in and take that space, kicking Eliwood off. Oh, yes indeed, if every single PoR and RD character was combined, I can see how Soren and the BK would come up to take that space. I only merged the people who appear on this list for simplicity, but that is good insight! Antagonists really didn’t do too well on this – the only one in the top 100 was the Black Knight himself. I would have thought Alvis would have been in there somewhere. Great to see Lyn doing well. I assumed most people wouldn’t remember her as a lot of fans only got into the series due to Awakening. That’s why I was surprised too! She was in Awakening’s DLC I suppose, and continues to be an assist trophy in the Smash Bros series, so perhaps that helped gain interest. Thanks for the analysis, the combined numbers are quite interesting. I agree that some shouldn’t have been split since they’re barely different (ie anyone from Tellius who’s not Ike really), but maybe for others it would make sense (for example, Odin and Owain are technically the same person, but are different enough) so like you said, maybe they didn’t want to make it complicated by having exceptions. I’m surprised at Roy’s position, considering the game he’s in never made it west. So it must’ve been the Smash Bros influence. A lot of people I know irl who are currently playing Heroes have either not played Fire Emblem at all, or only played a few games, so most of their knowledge of these characters do come from Smash Bros.
As for Corrin, I know that female Corrin is very popular, much more so than male Corrin; the Japanese Fates poll shows this, as well as the fact that there’s a Nendoroid AND Figma of her coming soon. The reason is, well, she’s “moe”. I know a lot of people simply like her default design. Another reason could be that there are a lot more female players of Fates (since it’s kind of a dating sim filled with bishounen; in my friends circle, 80% who’ve played Fates are female lol), so they would vote for their self-insert character of female Corrin. With Robin, it could be because male Robin is the default in Smash Bros (and having an amiibo as well). And the default female Robin isn’t as “moe”. I really wish you could get one male and one female vote per day, considering the prizes are based on standings for male/female characters separately. – I wonder if this poll had been made after Echoes came out, if any Gaiden characters would have made it…. Yes… they did it to keep it simple I assume. Perhaps if they do it again, it can be something to work on. Roy became one of the faces of Fire Emblem out west despite not having his game brought over. The stereotype of people asking “Are Marth and Roy in this game?” says enough! His return as DLC and amiibo and such I think further boosted support. Good points about Corrin! I know many of my friends (and a lot of readers in Japan) preferred her as an extension of themselves. However many more I know are okay with relating to either gender rather than male friends who prefer to stick with their own. These are just anecdotal observations though so I try not to include those in my own speculation. Overall though it is certainly a possibility. The “moe” aspect may indeed be a large reason though. True about fem Robin there, too. That game was down to more of the hairstyle choice and face, where as Fates had more defined body types and such to differentiate the two genders. Ryoma would be proud of your support! That’s placed pretty high considering the 700+ placements there were overall! I feel like Gaiden characters would’ve indeed gotten much more love with Echoes looming. There isn’t much info on it out there at the moment, so it makes sense that it still lost out in the end. Yeah, the midterm results definitely changed my votes. I was voting for a different favorite everyday, but after that I pulled all my votes into Henry (My favorite FE character). I’m still salty Leo beat him into the top 10 by only 44 votes. It was a nice and interesting article. It certainly gives a lot to consider in terms polls in general and what can influence them. It actually kinda surprised me that so many Awakening and Fates characters got votes. I actually really like the 3ds-Kozaki era games but it was always my impression that a lot of the loyal Fire Emblem fans hated the new games and preferred the older games, granted I also like the older games but I always felt that for a lot of people, liking the old Fire Emblem games and hating the new ones was kind of a package deal. It’s nice to see numbers that suggest appreciation of the new and old games, like I have. Anyway, I certainly appreciate the time and effort you put into your analysis. Well Done! Oh, though I think you forgot to merge Lucina’s votes with Masked Marth’s. It doesn’t really change up any of the top rankings but it does put Lucina’s vote count up to 48,295 which is only roughly 1,600 below Lyn’s vote count. A fair amount closer and more competitive score wise. Or who knows maybe people thought it was a third version of Marth and voted for her unknowingly. Lol wouldn’t that be funny. There are plenty of old fans that, even if they do not like the newer games, do not disparage those who do! (Myself included). There are plenty of new ones who do not rebel against the old games simply because of whatever bad impressions old fans give. xD there are nice people out there, just hidden behind the notably nasty ones. : ) either way the silent majority shows itself here, as there are plenty of fans brought in by these two games! Nice analysis! It was fun to read through this. One minor nitpick though, you said all male Smash Bros. characters made it into the top 10 in the first section about male characters, but male Corrin didn’t make it. You talked about male Corrin later in the piece though. Also I stuck voting for characters I liked (Guy, Canas, Merlinus for the lols) despite the midterm poll, although I had already voted for Hector and Ephraim who were already listed. The midterm results did influence my voting patterns. Until then I was voting for Trec every day, and afterwards I switched to Dorcas. Dorcas! xD That’s definitely the most amusing candidate on there. Thanks for the comment! It really does seem like it influenced plenty, as I speculated. I gave all of my votes to Lute except the second day (where I had a temporary lapse in judgement) which I voted for Awakening Tiki. I agree that it probably would’ve been better to have a seperate polls for male and female characters. I don’t know who I would’ve voted for if there was, but it would’ve balanced out the disparity between the two lists at least a little I think. I believe that revealing the midterm results was a huge influence during the remainder of the voting period, I saw many comments on various sites from people talking about how they were going to keep Lyn in the lead or to bolster their other top-ranking favorites. It certainly encouraged me to continue voting for Lute and only Lute when I say she made top 20 as well. I still can’t really tell if Lute actually has a bunch of die hard fans like myself, or if her voterbase just came almost entirely from memes and ObsidianWasp… Either way I’m happy to see her place so high. I can’t believe Dorcas got over 12,000 votes JUST because he was name-dropped in a commercial that’s like 10 years old haha. Overall, fun article. Thanks for sharing Kan! Yes, I was not active on any fan sites so wasn’t sure if the midterms did effect them beyond speculation, but from what you said it sure sounds like it did! I was initially surprised by the lack of Genealogy/Thracia representation, but as you said, those are older games that Intelligent Systems hasn’t revisited much compared to later titles. Dorcas is unexpected, though. I never thought much about the character, but evidently plenty of people have. Or a handful of really determined fans with too much free time. Yeah… the Jugdral games got pretty overshadowed as usual.